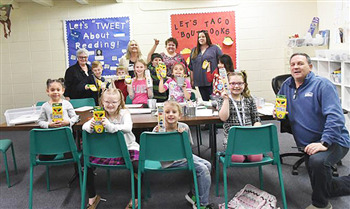 To celebrate the 100th Anniversary of Optimist International, the Warsaw Evening Optimist Club recently made a donation of 100 Crayola items to the Baker Youth Club. The Warsaw Evening Optimist Club is a volunteer club created by women, friendly and welcoming to all, and formed to benefit the children of the community. The Club meets at Wire & Steam Coffee House on the first and third Thursdays of each month at 5:30 p.m. for an hour. For more information, contact Trina Hoy at 574-551-6386. Pictured (L to R) are, front row: Lela Long, Alex Kellogg, Zaiya Garcia, Cannon Swinehart, Maddox Fruit, Shelby Harlan, Yaxiry Tamayo, Leah Shephard, Jayden Penrod, Baker Youth Club Executive Director Tracy Furnivall; back row: Trina Hoy, Tamara Drake, Connie Herman and Liz Walker from the Warsaw Evening Optimist Club. All photos © 2011 by their respective copyright owners.